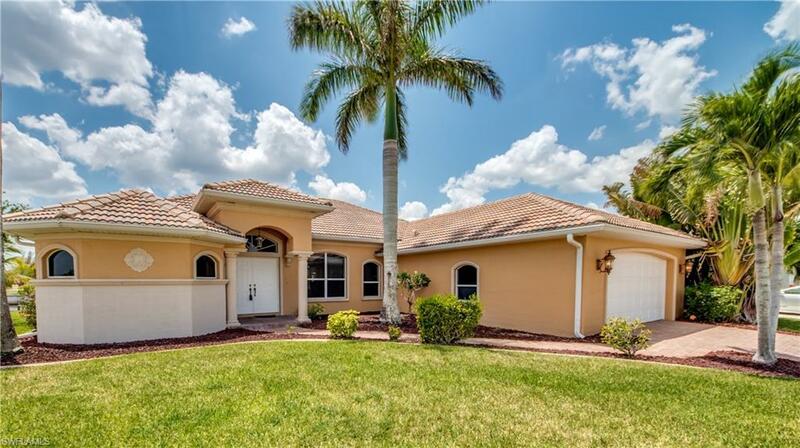 3504 NW 4th St, Cape Coral, FL.| MLS# 218020760 | Southwest Florida Residential Real Estate for Sale. Enjoy Paradise! With southern exposure, XL canal, a captainâs walk dock and a deck, and quick access to the Gulf of Mexico. The best fishing in SWFL is a short 15-minute boat ride to Matlacha. Cook your catch of the day in your spacious, open kitchen with views of the canal through sliding glass doors that run throughout most of the exterior of the home. The master bedroom has everything you need and more: his and hers walk-in closets, double sinks, a walk-around shower and a spacious tub for relaxation. 3 bedrooms plus spacious den that can be used as a fourth bedroom. Custom 42â wood cabinets, tumbled marble countertops, stainless steel appliances, 17â tile floors, paved driveway, and hurricane-resistant windows. The open floor plan makes it easy to entertain your guests while enjoying the refreshing large pool with an outdoor shower and pool bathroom. Close enough to everything you need, but far enough to be in tranquility. Home is pristine and ready for you to move in!